CD Purchase - special offer! Click the button below to buy via PayPal. You don't need a PayPal account as you can select to pay by credit/debit card. You can listen to tracks from the CD on the Recordings page! 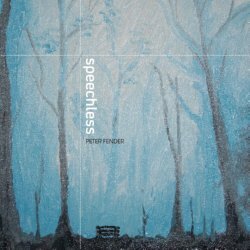 Peter's first CD, Speechless is a collection of his orchestral music. None of the pieces have been recorded before. The music is fresh and immediate, speaking clearly to the listener. There are many sections of chamber-like clarity, layered sounds (à la Charles Ives), and mesmerising ostinati. Sometimes there is just a whisper of sound but then a full-blooded climax is probably just around the corner! Add to that the solos for cello, sax, and mezzo-soprano and this disc contains something for everyone! "A project of skill and wit ...admirable line-up of musicians ... moves smoothly from sharp statements of powerful intent to balancing passages of sweetness." - The Musician, Autumn 2012.